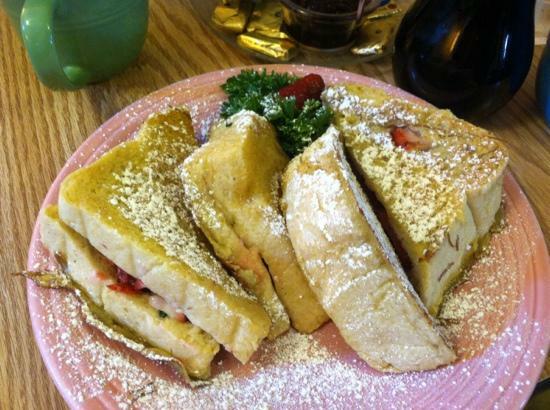 One of my top favorite places to eat in Cocoa Beach is Simply Delicious Café & Bakery located in one of the cottages between N 1st and 2nd Streets in downtown at 125 N Orlando Ave, Cocoa Beach, FL 32931. They serve breakfast and lunch between 8:00 a.m. and 3:00 p.m. Tuesday through Sunday—with Sunday Brunch ending at 2:00. It is best to get there early because they are so popular. Get there before 9:00 a.m. for breakfast and about 11:30 for lunch to reduce your wait time. When you arrive, give your name to one of the servers behind the counter or if they are busy, add your name to the notebook by the pastry case. It is a bakery, so all the breads are fresh and delicious. Plus, the pastries and desserts are delightful. The breakfast sandwiches and quiches are my favorite for breakfast while my family indulges in the custom omelets. For lunch, the chicken salad is my choice and my family enjoys the salads. I like to treat myself to a fancy hot beverage and my family loves the ice tea with special sweetener provided on the side. Enjoy!